The Wind Chill Temperature (WCT) is also known as the "feels like" temperature and is based on the rate of heat loss from exposed human skin caused by the combined effects of wind and cold. As the wind increases, the body cools at a faster rate, causing a drop in skin temperature and eventually the internal body temperature. While the summertime heat index chart combines the effects of high air temperatures with high humidity levels to reach its "feels like" temperature, wind chill charts combine the effects of low air temperatures with wind speed to attain the wintertime "feels like" temperature. If precautions are not taken when venturing outdoors, cold temperatures and low wind chills can result in frost bite, and lead to hypothermia. Exposure to low wind chills can be life threatening to both humans and animals alike. So when going outdoors when wind chill temperatures are low, it is imperative that you dress in multiple layers of warm clothing, wear a warm hat, keep dry at all times, and try to stay out of the wind. Although all exposed skin should be covered, the most vulnerable parts of the body are the extremities such as fingers, toes, ears, and the nose, so it is crucial that these areas be protected from exposure to the cold air and wind. In extreme cold, it's best to cover your mouth to protect your lungs from the bitter cold, and wear a warm pair of mittens since they offer better protection than gloves. NOTE: The threshold for Wind Chill temperatures is normally considered temperatures at or below 50 degrees Fahrenheit and wind speeds above 3 miles per hour. Wind Chill temperatures also assume no impact from the sun (i.e., a clear night sky), since bright sunshine may increase the Wind Chill temperature by as much as 10 to 18 degrees Fahrenheit. In 2000, the National Weather Service brought together a large group of experts to revise the old Wind Chill Chart that was found to offer inaccurate wind chill values that were often far lower than they should have been. The large number of wind chill temperatures in excess of 100 below zero found on the lower right side of the chart below, illustrates that very point. The former WCT Index utilized by the National Weather Service in the United States and the Meteorological Services of Canada, was based on the outdated Siple and Passel Index that dated back to 1945. Extensive clinical trials were undertaken to help develop a more accurate formula to calculate how wind-blown cold air feels on human skin and determine frostbite threshold values. The end result is a Wind Chill Temperature Index that is more accurate, understandable and useful in determining the dangers from wind coupled with cold temperatures. 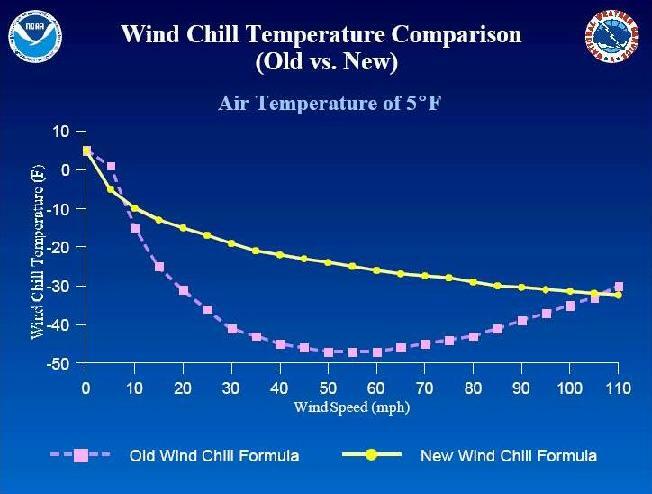 The new Wind Chill Chart is presented above, while the old Wind Chill Chart -- in use until late in 2001 -- is shown below. This Wind Chill Temperature comparison chart contrasts the old Wind Chill formula with the new.